Paddle Wars: Hit The Wall is a fast-paced arcade action game that features 20 exciting levels, surprising twists, cool powers, great music and a refined gameplay that uses the best of the past, and yet innovates to create the best of the future. The current release is only a prototype, it is intended to allow playtesting, so the game can be refined to suit the taste of the players, and we will not settle with anything that is less than awesome, because we are the Awesome Games Factory. Also join our forums, and follow us on Twitter, we will be constantly giving updates about the game development, having conversations about the game and general game development and giving some insight on how the game was designed, also there are some tasty screenshots of features never presented before to be delivered to loyal fans. We took the game arcade cabinet to Campus Party, and had loads of success, read here what happened there, and the changes that we did on the game. It is a bit late for that, but the beta has been made public as a gift to all fans! The beta got cycled again, with lots of small fixes! The first beta cycle end, now the second beta cycle starts, report of the beta 1 on this news. Windows version of Prototype 3, in a .exe self extractor. Prototype 2 of Paddle Wars: Hit The Wall, this is the .exe version. For changes, refer to the news. 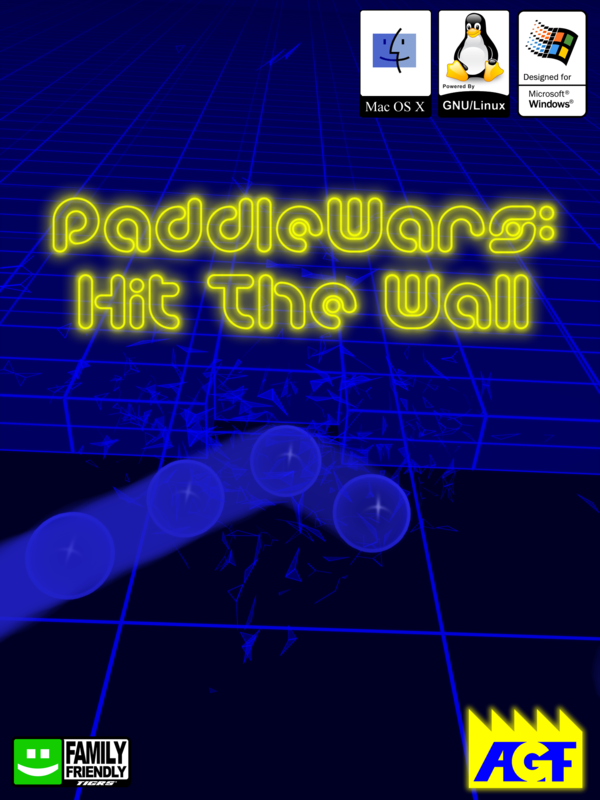 Second prototype of Paddle Wars: Hit The Wall, compressed with .7z Refer to the news to see the new features. It definitely has my vote, this game is awesome! I like it so much that I wanted to contribute in some way. So now you have a Mac version! Have fun! It's awesome, and quite fun. Nominated for IOTY. It's a spectacularly fun game! Sooo, is there going to be a linux version or... ? Actually, there are a Linux version... Sorta. If you compile it yourself it works fine, I am trying to figure how to make a binary version that work easily on any machine. I develop using a Fedora. Paddle Wars is a truly fun game. I'd certainly press all the "like" or "reference" buttons I could, but the truth is that I don't use Facebook or any of that nonsense. I frequently recommend games I like to my friends though, but they don't care much for indie games, especially not those of the arcade type.